I have a bunch of dishes I like cooking and which people seem to really enjoy. They all have a few things in common – I like food that combines a few simple tastes, is relatively simple to cook, and which uses cheap ingredients. As an added bonus this dish should be paleo diet compatible. So here’s something I did today..
Pork Belly. Get about 200 grams per person. Go for slices with a lot of succulent fat. I’m currently getting mine from Ginger Pig. Fresh ginger. Lots of it. Garlic. To your taste; 1 large clove per person works for me. Japanese style soy sauce. Japanese soy is super fragrant and lighter compared to Chinese soy sauces. 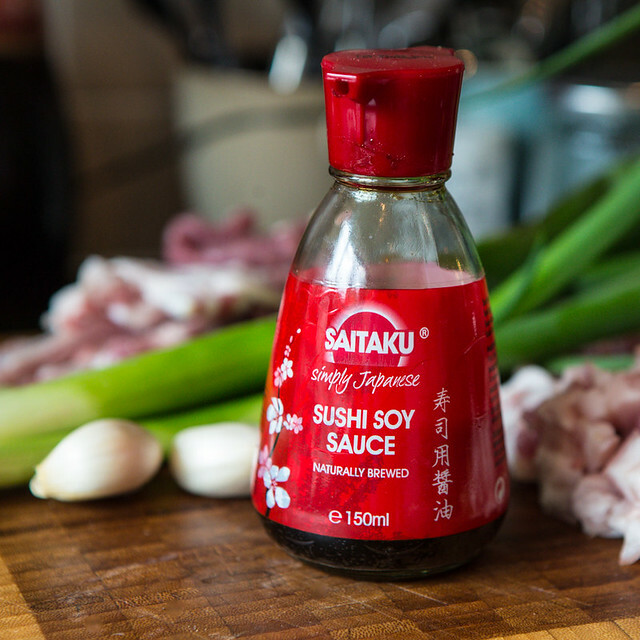 In my experience (from UK and Finland), Japanese soy sauces are now significantly easier to get than even 5 years ago, so getting the right thing shouldn’t be very hard anymore. A whole cabbage. I recommend pointed cabbage because it’s easy to get leaves separated intact. Fresh spring cabbage is another option. Fresh pomegranate for garnish. Optional. Cooking oil. I use rapeseed oils for frying, they’re fairly neutral tasting and research claims they produce less carcinogens when fried than most other oils. 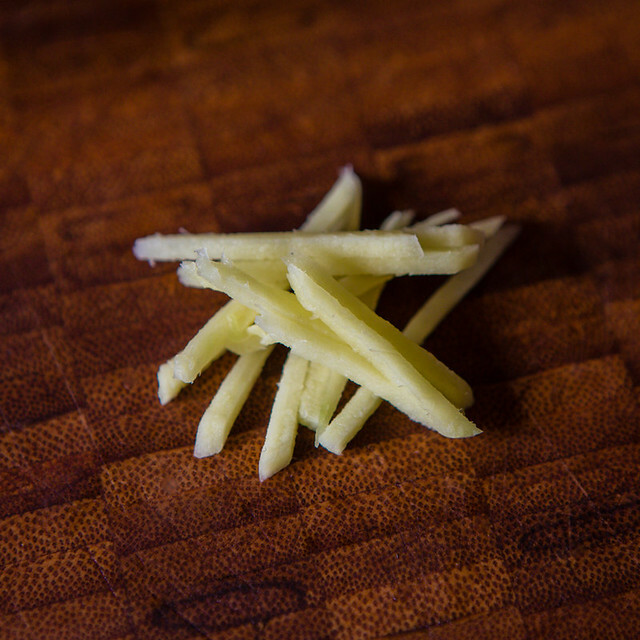 Slice the ginger to 1x1mm sticks. A mandolin does wonders here. 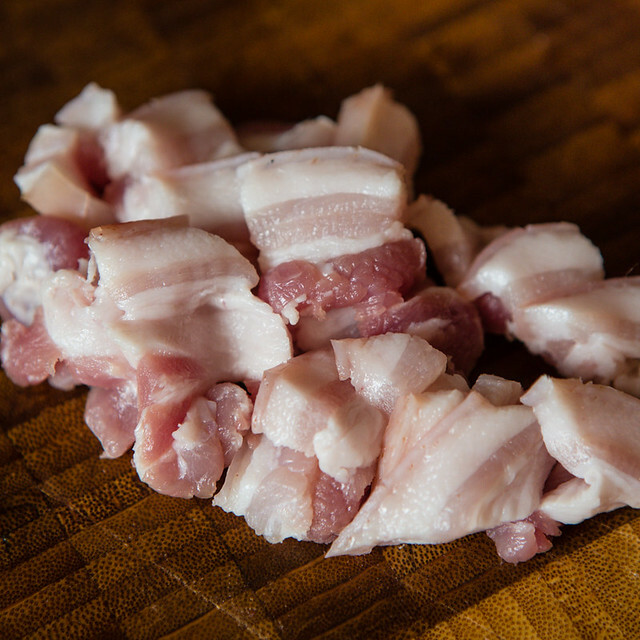 Slice the pork belly into small bite sizes. Slices that are around 3mm thick and 15mm wide are perfect. But no worries if everything is not perfectly sized. I recommend removing the skin – if you leave it on, remember to add considerably more time for the skin to cook until it’s tender. Put a generous dash of oil onto a pan and put the ginger slices on medium-low heat. 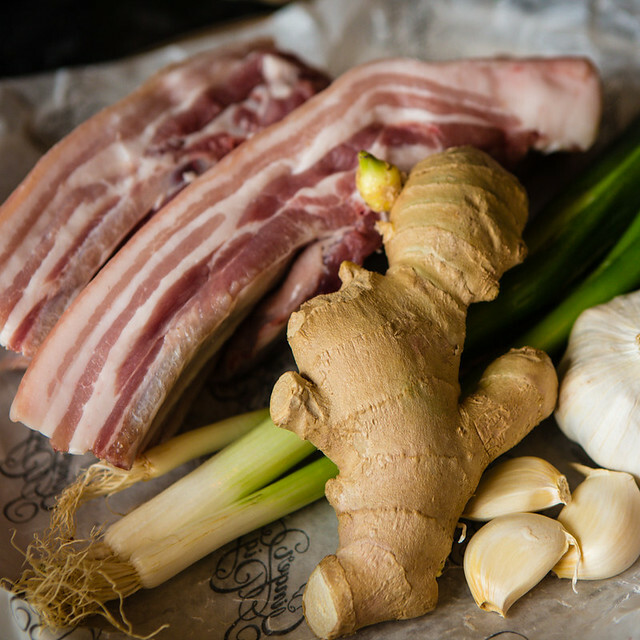 Let the ginger cook softly until it’s all cooked through and very soft. This guarantees you’ll get the best of the tastes from the ginger, as well as nice mouth-feel. Do not allow the ginger to brown, if you see any browning you have too much heat on; take off the pan and let it cool before putting back on reduced heat. When the ginger is all done, put crushed and sliced garlic on. Let it cook for a very short while. Again if the garlic browns, you’ve just blown the taste. When the garlic is slightly cooked, put the pork on. Cook on medium heat until it’s fully cooked and then double that time. The goal is to have the pork be soft and absolutely chock full of the ginger aroma. While the pork is cooking, slice the spring onions into thin rings. Separate the pomegranate seeds. 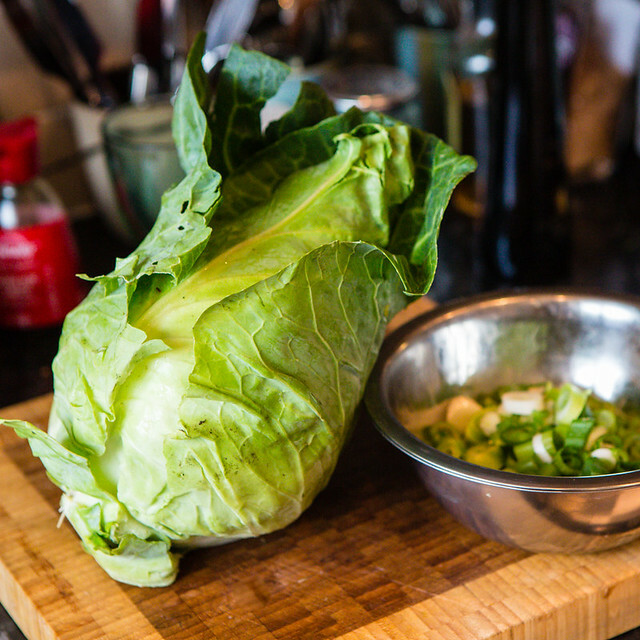 Separate the cabbage leaves; try to keep them intact. 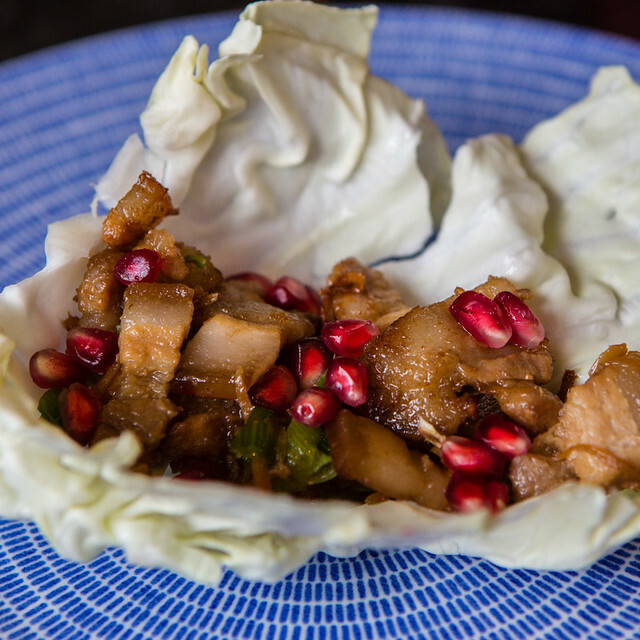 When the pork is super thoroughly cooked, add a dash of soy sauce (to taste – lots if you like salty, less if not) and spring onions on the pan and let it cook for 30 seconds or so, then move the dish to a serving bowl. Decorate with pomegranate seeds. Serve the cabbage leaves on a large plate. The idea is, you get a leaf that serves as a plate, put ginger pig into your leaf, roll the leaf into a package and chew through. This entry was posted in Food on September 15, 2013 by Sulka.